It is positively unheard of for the support staff Color War Team (the Green Team, as they are known) to be so fiercely competitive that the counselor team (Poiple) is forced to surrender! And yet, that is exactly what happened during the summer of 2013 at Camp Pembroke, an all-girls Jewish cultural camp located in Pembroke, MA, that is part of the Cohen Camps family. For those of you who may not be familiar with the intensity, competitiveness, and downright just plain fun that is all part of any Color War, allow me to explain…briefly! The campers are divided into two teams, blue and gold, for three days of competition – including athletic events, a poster competition, an apache race, a sing competition, a dance competition – and lots more. At the conclusion of those three days, after agonizingly analyzing the points earned, either the blue team or the gold team is declared the winner. At Pembroke, to spice things up a little, we add two more teams that compete against one another while the camper contests are going on – the Green Team, made up of our support staff, and the Poiple team, our counselors. Our campers are all excited about the events of their own Color War and the possibility of their own team winning it all – but are also completely engrossed in the competition between the support staff and their beloved counselors; it’s a wonderful “two-for,” to be sure! 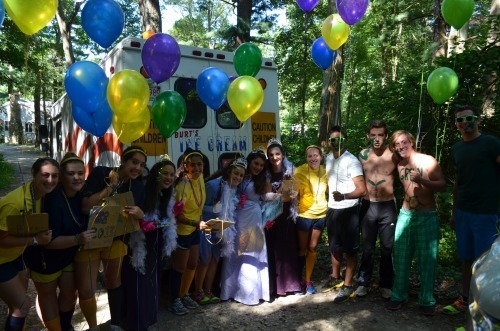 The 2013 support staff was truly part of our Camp Pembroke family, and as such, were as determined to win their Color War as any of our totally invested ‘Brokies were to win theirs. The girls really welcomed our maintenance, housekeeping, and kitchen staff last summer, and we were a camp family like I had not seen in many years. In fact, in a very few hours after Color War broke with the arrival of an ice cream truck carrying the B and Gs (the 13 counselors who lead the four teams), it became very clear that while the campers were absolutely rooting for their own team, they were caught in a dilemma as they tried to decide whether to support their Poiple counselors or yell and scream in encouragement for the Green Team! There is something very special about our all-girls camp; there is a unique sisterhood that unites these girls in a stronger bond than can be seen in most college sororities. Together, the campers are empowered to try things they would perhaps never attempt anywhere else on earth. Their friendships form and grow as the girls learn that there is something to be appreciated in every single person they meet. Our girls find it easy to be themselves, to explore who they really are, Jewishly and individually, in an environment devoid of the social pressures they face in the outside-of-camp world. They learn to work as part of a team, and to live harmoniously in a community setting. Camp Pembroke really demonstrates Girl Power at Work in the most positive ways. Leadership skills are learned at camp – and our campers utilize those skills all summer, including during Color War. Somehow, during the Color War of 2013, the campers and staff alike were united in their conviction that the Green Team really and truly actually DESERVED to win; there was none of the unhealthy competitive frustrations that sometimes exist in other competitive events. One of the most wonderful aspects of the all-girls camp is that everyone loves color war, competes in the events to the best of their ability, screams for their teammates, and participates in the sing (the final event) with all their heart and soul. And then when the winner is announced, everyone cheers – yes, everyone – but honestly, we all had a great time and truthfully, that’s what’s important and it doesn’t really matter who won or lost.